Forget sleeping bags on the ground. 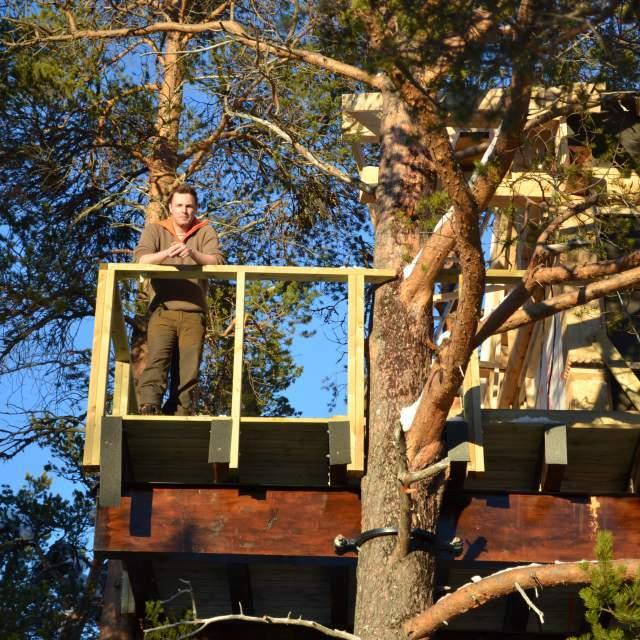 Structural engineer Sondre Ertshus has built a proper cabin on top of four pines. Six meters above ground in Soknedal, 24-year-old structural engineer Sondre Ertshus has built something quite out of the ordinary: A cabin, weighing several tons, resting upon four pines, with enough room for an entire family to spend the night surrounded by beautiful nature as far as the eye can see. “Here, you’ll find yourself slightly above the nearby treetops and you have a good view of the mountains Kaldalsknippen and Gynnildfjellet, whilst you’re also in close contact with the local birdlife”, Ertshus says. Ertshus originally began the project in 2016 and had a hunting outpost in mind. But when he came across similar cabin projects further south in Norway, he was inspired to up his ambitions and build a proper cabin that could also be rented out. Even though part of the cabin’s charm is of the creak and sway variety, the structure is actually quite steady and secure. Along with the four pines, Erthus also built three concrete foundations for three additional support pillars. In addition, a solid fence runs around the cabin. Right now, the Ertshus cabin is the northernmost addition to the Norwegian treehouse family. Further south, there are several cabins available for rent. Tree Top Hut in Brumunddal, Hedmark offers several cabins with room for between six and eight people. Here, you can feed squirrels and get up close and personal with the birds whilst living in classic Norwegian cabin interiors. Most of the cabins have fishing and bathing opportunities nearby, and also offer facilities like bio-toilets and grills for barbecuing. For those who prefer their cabins with a touch of modernity, a trip further east in Hedmark will take you to Gjerstad and Trehyttene. Here, you will find architecture that cuts straight lines through dense forestry. Along with the three-story cabin Kråkeslottet (the crow’s castle, pictured above), the family behind the project have also built a smaller cabin dubbed Gjøkeredet (the cuckoo’s nest), seven metres above ground. Even further south, you will find Kraggbua, a cabin built seven metres above ground by the company Tretopphytta, focusing on bringing visitors closer to nature and offering good photo opportunities of the nearby fauna.